Three pins, identifying three unsolved homicides, remain stubbornly stuck in Joe Leaphorn's orderly wall map and in Joe Leaphorn's orderly mind. Defying the lieutenant's rational solutions, the crimes' only connection seems to be motiveless malice. With the attempted murder of Officer Jim Chee, another pin is added to the map, and a hint of witchcraft enters the picture. Is a Navajo "skinwalker"-one who has turned away from the harmony of the Navajo Way to assume the terrible powers of witchcraft-killing people? Or are the victims themselves practitioners of this form of Navajo witchcraft? 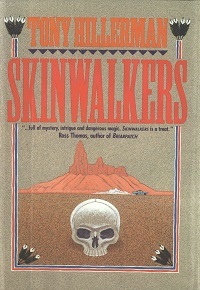 Skinwalkers takes the reader deep into the canyons, mesas, and immense empty spaces of the Southwest, the Land Between the Sacred Mountains, and into the clan society of America's largest tribe. Unpretentiously imbued with the mystique of the Navajo culture, this is a moving book which will linger in the memory of its readers.